Do you suffer from Asthma or Allergies ? This nasty little critter could be the trigger that starts of your symptoms. The household dust mite is sharing your bed and pillows with you and your family every night. They love warm, dark, damp places to live with a ready food source. They feed on the scales of skin that we all lose every day, and because we spend approximately one third of our lives in bed, this is their home that they share with you. YOU are supporting a giant restaurant that feeds in excess of five million mites every night ! 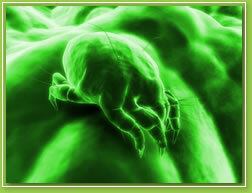 Every time you roll over in your sleep, you are creating a cloud of minute dust mite feces. As you breath in, it is like a giant vacuum cleaner, sucking in all those feces. It’s no wonder many of us wake up feeling sick in the morning. At Get Shorty, we use an Ultra Violet Cleaning System, in conjunction with Hot Water Extraction and Specific Allergy Relief products, to help eradicate dust mites and make your bedding safer and healthier for your family. * “tight” chest, & many others. Why not have your mattresses & pillows cleaned and sanitized to protect the health of your loved ones. Get Shorty can supply a complete treatment of mattresses, pillows, carpets and other soft furnishings, including children’s toys, to give your family a healthier home and lessen the chances of allergy & Asthma attacks.